Daphne Oram (1925 – 2003) is one of the central figures in the development of British experimental electronic music. Early in her career, she declined a place at the Royal College of Music to become a “music balancer” at the BBC, and as the co-founder and first director of the BBC Radiophonic Workshop. However after Daphne left the BBC (in 1959) her research, including Oramics, continued in relative secrecy. 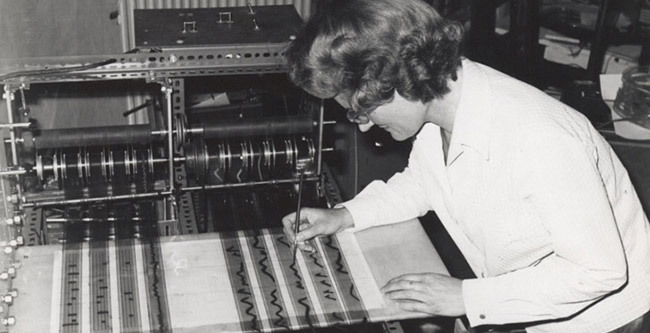 She is credited with the invention of a new form of sound synthesis – Oramics. Not only is this one of the earliest forms of electronic sound synthesis, it is noteworthy for being audiovisual in nature – i.e. the composer draws onto a synchronised set of ten 35mm film strips which overlay a series of photo-electric cells, generating electrical charges to control amplitude, timbre, frequency and duration. Goldsmiths, Unveristy of London have collaborated with the Sonic Arts Network to bring this collection into the academic community where it can be properly studied and developed. For more information on the research and development of Oram’s work, visit The Trust page.